A genuine and efficient hunting and trekking kukri, the ultimate hunting knife; be the HUNTER..
Sirupate Hunter Khukuri is one of the innovations of KHHI, a modern kukri that is made with a blend; exaggerated and experimented especially with the handle (grip). It is also the outcome of inspiration and fascination of the maker towards other famous hunting knives of the world. 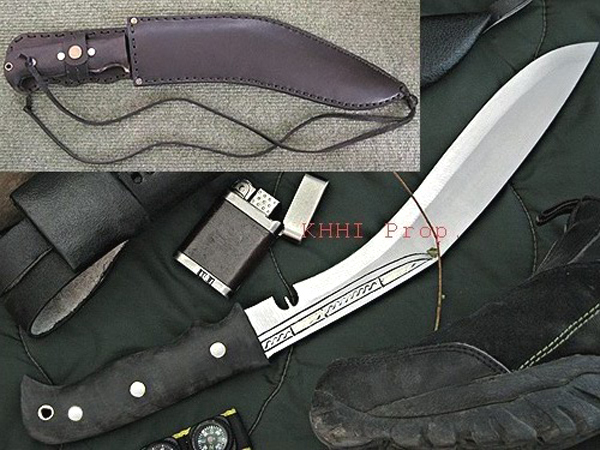 This sirupate khukuri is specially designed for hunting so called the hunter kukri. The blade is basically the famous “SiruPate” version; slim and light, that makes the knife more practical because of it’s handy weight. It is also semi-polished at the same time to furnish an attractive look and to avoid quick rusting. The handle is the copy of ‘Bahadur’ khukuri knife from KHHI’s product line, which actually is a copied version of the famous “Cutlery’s knives”. The flat tang goes all the way through the handle and metal rivets are fitted to strengthen the fittings. The two horn plates are first firmly glued to the tang by using epoxy and 3 x rivets are fitted to secure the entire handle fixture. A see-through hole at the end of the handle supports a leather cord (lanyard) for the user to belt around his wrist. This prevents from dropping the knife by the user in case his hand gets sweaty or slippery. The front portion of the handle (contour and curving) is made to craft the best possible comfort grip for work. It is also unpolished so a sturdy and steady grip is possible. The scabbard also differs from the regulars. It is one of its very strong points. Unlike other kukris’ sheath, 2 mm ALL leather is used to make its sheath – simple and strong - intended to make the kukri as light and easy handling as possible and effortless carry-able at the same time. Traditional wooden frame is discarded and replaced by this thick leather, as shown in the inset. The handle belt strap fitted to lock the handle simply makes carrying easier and running swifter. Brass rivets are positioned in the vital parts to ensure that the sheath remains together forever. Similarly, a lanyard loop along with a thigh leather cord is secured at the tip of the sheath to tie around thigh portion in order to prevent wobbling even when the carrier is in speed motion. All these special and unique features of this knife make it a genuine, efficient hunting and trekking kukri. The ultimate hunting kukri knife for you, “be the HUNTER not the HUNTED”.